Well that was nice. Thanksgiving I mean. Turkey and cranberries and wine and family and five pies do leave me with a warm glow of contentment that may even leave me cheerful enough to forgive my visiting father in law the sin of finishing ALL of the leftover stuffing. Or dressing, as my father insists on calling it, even though it was, in fact, cooked inside a turkey. Anyway, the point is Thanksgiving was lovely, but it is over, and moreover, it is now December 1, which means that even the grinchiest of grinches cannot deny that it is now more than appropriate to talk about Christmas. I love Christmas — the deck the halls, the ho ho hos, the kisses under the mistletoe, the presents under the tree. I even love malls at Christmastime — sure they’re crowded, but they’re beautifully decorated and they’re playing Christmas music. But I really love Christmas food. It’s a time for gathering and gifting, when food plays a central role not just in the one day, but in the whole season. It’s a time for pies and cakes, hors d’oeuvres, soups and roasts, but nothing says Christmas quite like the Christmas cookie. And that is why I chose to kick off the Christmas season at The Domestic Front, and the first month of Gourmet Unbound (a blog event that honors the late great Gourmet magazine by featuring recipes from its archives each month) with this cookie recipe from the December 1999 issue of Gourmet for Skibo Castle Ginger Crunch. I looked forward each year to Gourmet’s annual December issue with its beautiful cookies invariably gracing the cover. This year, no issue, but a virtual cookie party. These particular cookies are Scottish in origin (I spent my honeymoon in Scotland and we drove right past Skibo Castle, which is in the glorious Scottish highlands). 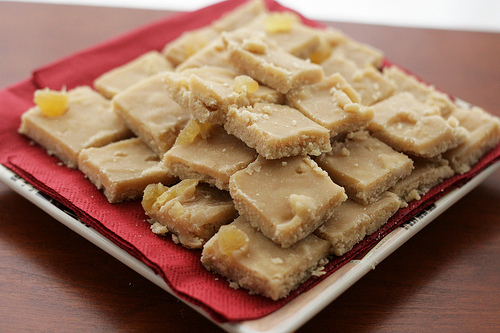 They’re a simple shortbread base topped with a ginger fudge then cut in tiny pieces that melt in your mouth. They’re easy as pie to make and dangerously easy to eat — it wouldn’t be outside the range of possibility to eat an entire tray in one sitting, as they are irresistibly “more”ish. They call for Lyle’s golden syrup, a caramel tasting cane sugar syrup which is widely available in many gourmet stores and contributes a beguiling flavor to the cookies, but if you can’t find it, I would suggest substituting with a mild honey. I also added some crystallized ginger to the top, to up the bite, but they’d be good without it — simpler and neater. They’d be fantastic as bites after a cocktail party, or in a pretty tin to give as a gift, or left out for Santa Claus. They’re a great kick off to a great holiday season. Optional - 3 T chopped crystallized ginger. Preheat oven to 350°F and grease a 13- by 9-inch baking pan. 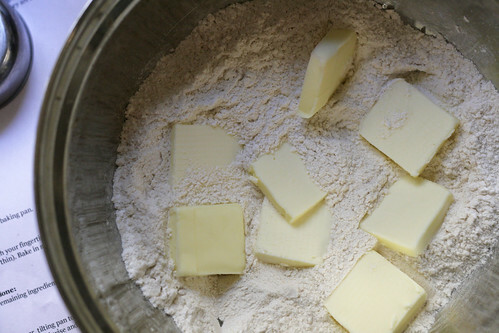 Sift together dry ingredients and blend in butter with your fingertips or a pastry blender until the mixture resembles sand or meal. Press evenly into bottom of the pan -- the base will be very thin. Bake in middle of oven until golden and crisp, 20 to 25 minutes. 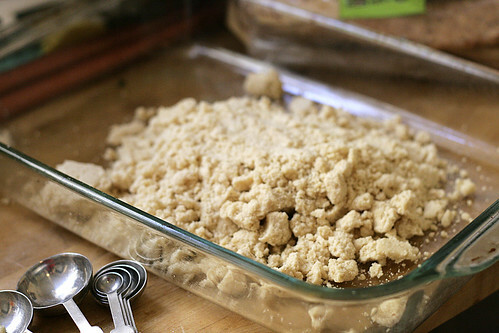 Just before shortbread is done, melt the butter in a small saucepan and whisk in remaining ingredients until smooth. Bring to a boil and simmer, stirring, 30 seconds. Remove shortbread from oven while it is still warm, pour topping over the shortbread, tilting the pan to cover the shortbread evenly. If desired, sprinkle with crystallized ginger. Cool in the pan, then cut into small squares and remove with a spatula. Those look absolutely incredible! Would drizzling chocolate over the top be too much? Yum – this looks like it could be a great Christmas gift… I sadly did not get my act together for GU this month but am all prepped for next month! I cut this out of the magazine when it came out and have been making them for years. They are delicious and a great holiday treat. 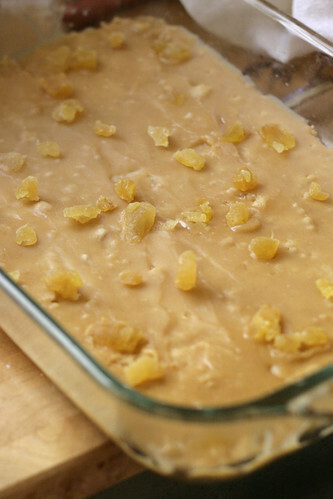 Thanks for resurrecting this great recipe – I suggest everyone make a batch! Oh yum, these look good. I just checked and saw you can get the Lyle’s syrup from Amazon in case I can’t find it local. I so need to try these! I guess maybe I messed these up. I found the shortbread base to be very greasy/oily when I cut them despite using 3/4 stick of butter. And though I simmered 30 seconds, my ‘fudge’ layer didn’t come together right. It almost appeared to be separated when I poured it on to the crust. I put it down in the cold basement to help it firm up before cutting, and the ‘fudge’ did turn opaque, but it remained very sticky and kind of shiny. Don’t get me wrong; I loved the flavor, but I think I may need to play with my technique a bit. My cut squares never looked as pretty as your picture, and I sure couldn’t place them on top of each other like that because they’d stick to the layer below as the fudge is still so sticky–even 3 days later.